Canang Sari is a symbol of offerings, made every day by the Hindus to the Creator. Canang can be found at the temple, a small worship place, street, or every entrance of the Hindu houses. Formerly, Canang Sari is the creation of MPU Sangkulputih, who’s become "Sulinggih" replace Danghyang Markandeya in Besakih Temple. Canang sari is derived from the Balinese words "sari" means essence, while "canang" consists of two syllables of Kawi language, "ca" means beautiful and "nang" means purpose. Canang Sari has a beautiful color and filled with various flowers. In general, the flowers consist of four color such as white, red, yellow and blue. The colorful flower was chosen because it has a deep meaning and is placed in specific directions. White flower is a symbol of the Iswara (the flowers are pointed to the East). Red flower is a symbol of Brahma (the flowers are pointed to the South). Yellow flower is a symbol of Mahadera (the flowers are pointed to the West). While blue flower is a symbol of Vishnu and the flowers are pointed to the North. Ceper, a square-shaped tray (or round) as a base, symbol of "angga-sarira" (the body). Made of yellow coconut leaf, shaped in such a way, and join together with the "semat" or pin (made of bamboo, split up like a toothpick, and then inserted into the leaf and broke it with finger. Rice (Wija), as a symbol of the seed, the beginning of life from the Creator. Porosan, made of betel leaf, lime and gambier, symbolizes the Trimurti, the three major Hindu Gods. Shiva is symbolized by lime, Vishnu is symbolized by betel leaf, and Brahma is symbolized by gambier. Jaja, Cane and Bananas, symbolizing the life of the universe. Sampian Urasari, made of yellow coconut leaf, symbol the wheel of life. 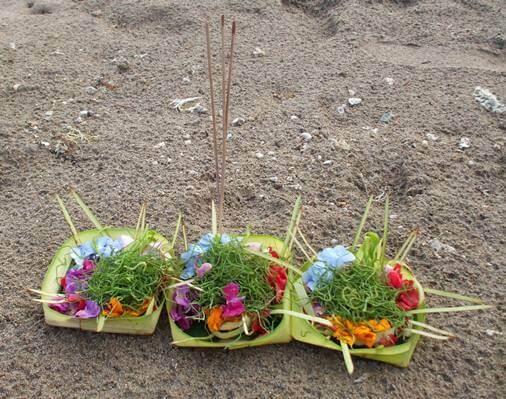 Kembang Rampe, made of pandanus leaves, placed in the middle of a flower, a symbol of wisdom. Boreh Miyik, the symbol of good attitude. Perfume, made of water flowers and fragrances, as a symbol of tranquility and self-control. 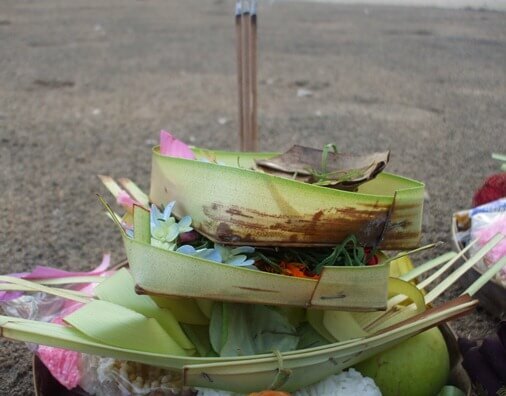 Canang sari is used for a day, and replaced back the next day with the new one, as a form of thanking for the peace given to the world by the Creator. It is completed by placing on top of the canang, an amount of kepeng (the coin money) or paper money as a symbol of the essence or "sari". Canang is so entrenched in the lives of Hindus, and its existence is claimed to maintain the balance of the universe through the Tri Hita Karana Philosophy or three causes of happiness. The philosophy consists of Parahyangan, Pawongan and Palemahan. Canang sari is offered every day, to strengthen the harmonious relationship with the Creator as a form of Parahyangan. The materials for making canang is acquired through social interactions such as buying the flowers, coconut and others, so as to create a harmonious social life as a form Pawongan. The materials is created through the goodness of nature, therefore the people will keep the existence or preserve it in nature and create a harmonious relationship with nature or Palemahan (eg: flower is always necessary to make cymbals every day, so people planting and make it sustainable in nature.